"Hey, come and let's dance this dance, come, darling darling"
The Armenian Final was held on February 14th at the Sport & Concert Complex in Yerevan, hosted by Gohar Gasparyan & Avet Barseghyan. The winner was chosen by a mixture of televoting (50%) and an "expert" jury (50%). Inga & Anush Arshakyanner came 10th at the ESC. 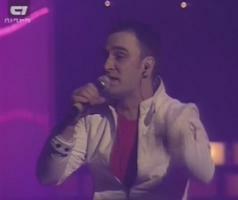 Shprot was a backing singer for Armenia in ESC 2006 and Tigran Petrosyan was a backing singer for Armenia in ESC 2007 & 2008.